Dozens demonstrators showed up outside of a US Immigrations Customs and Enforcement facility in Southwest Portland today to block a bus they say was bringing undocumented immigrants to a Tacoma detention facility. The crowd, perhaps has large as 100-strong at one point, showed up to support five activists who'd "chained" themselves in front of the facility, 4310 SW Macadam, to stop what they say was "a bus carrying undocumented community members." The crowd sang and chanted amid warnings from local and federal police to clear out. Cops eventually began arresting demonstrators around 5:30 pm, and things got weird. After arresting three supporters, Portland Police turned their attention to members of the chain. 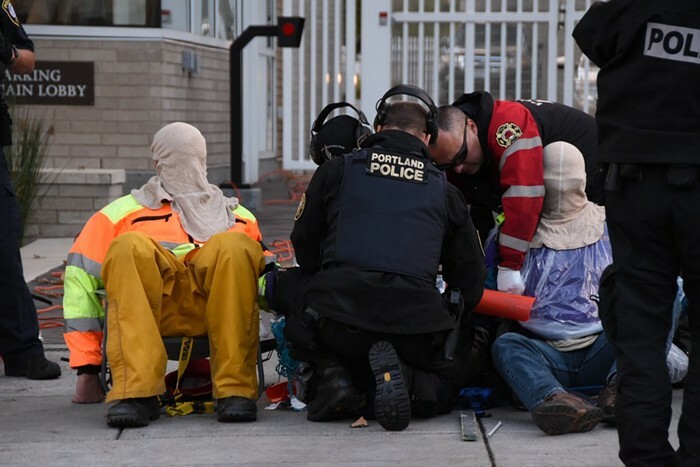 Prior to severing the tubes that connected the demonstrators, police covered their heads in hoods and put headphones on their heads, in some of the stranger images to emerge in a year of strange protest images. They removed the headphones and hoods after breaking the connection, and carted the protesters away. 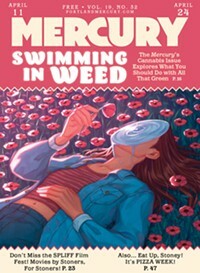 This evening, Portland Police Bureau spokesperson Sergeant Chris Burley told the Mercury the tactic was employed for the safety of the demonstrators. 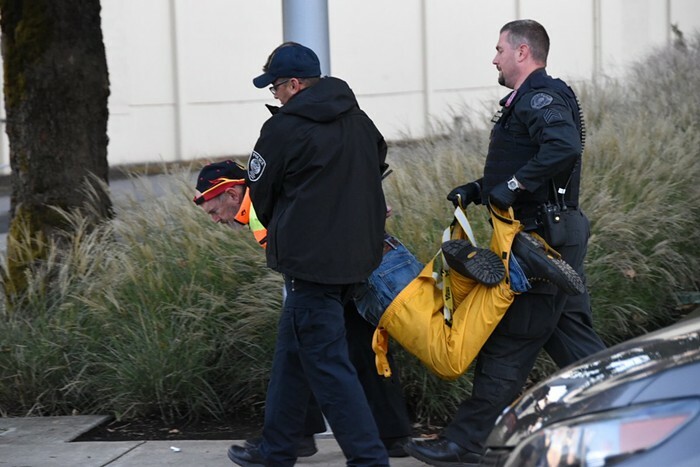 "In the process to remove people from blocking access and egress to a building in the 4300 block of SW Macadam Ave, specially trained officers were required to use tools that caused sparks," Burley wrote in an email. "In order to protect protesters from the sparks, fire retardant hoods were placed on the protesters. 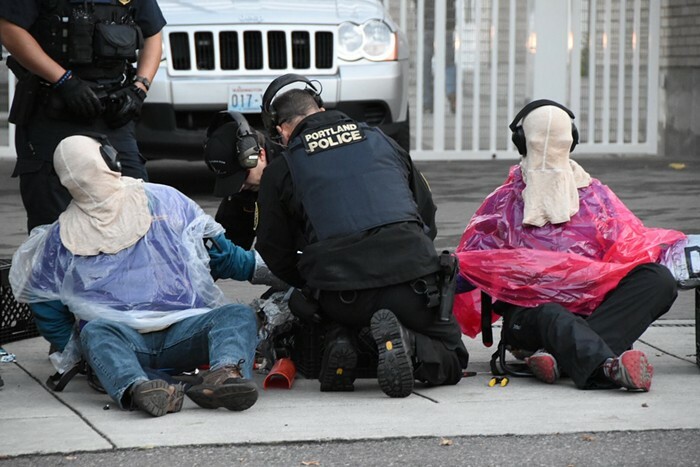 In addition to the fire retardant hoods, officers placed ear muffs on the protesters to protect their hearing from any loud noises created by the tools." Medical personnel were standing by, Burley said. Update: The PPB, clearly sensitive to the optics the situation created, provided more information Wednesday night. The bureau notes the mechanism by which protesters had attached themselves are known as "sleeping dragons." In this case, Burley says, they were made of "plastic pipe, yarn, fabric, chicken wire, steel bolts, and chains." Burley says police feared the pipes involved were metal, which could have created sparks when cut. The demonstration was organized by a group calling itself "End Deportations Now." In a release, the group cited Donald Trump's recent repeal of the Deferred Action for Childhood Arrivals policy and high-profile ICE enforcement locally as reasons for their action. 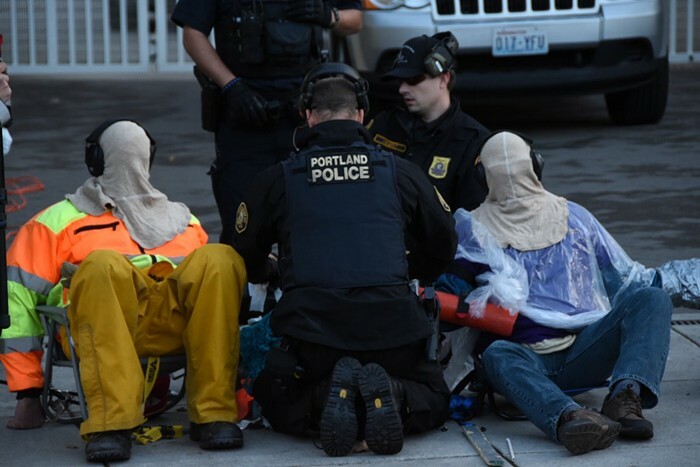 “We are here to shine a light on this vicious practice of deportations that is happening in our communities in Portland nearly every day,” Paul Riek, one of the five activists in the "chain" was quoted as saying in the release. Though the group said it was hoping to stymie a bus carrying undocumented immigrants to Tacoma's privately run Northwest Detention Center, no bus was visible outside the facility. The group was also impeding ICE employees looking to leave in their cars after work—some of whom looked on from the building's lobby. Demonstrators offered them bus passes. Update: There was a bus. As of 6:45 pm, police had cuffed six people—three members of the chain and three of their supporters. They didn't detain the remaining two members of the chain. 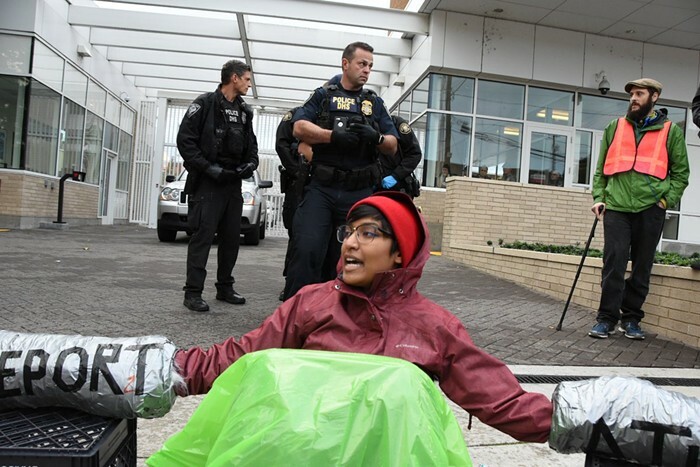 Despite the fact the Portland ICE building is a federal facility, Portland cops responded to the scene because demonstrators were on the sidewalk, which is controlled by the city, according to a US Department of Homeland Security officer on the scene. The five community organizers are: May Wallace, a retired teacher and artist; Peter Parks, a retired union activist and immigrant rights fighter; Amina Rahman, a Muslim, first generation Bengali American raised in Portland and labor organizer; Nina Spring a community health nurse and mother of two from Portland; and Paul Riek, a member of St. Andrew’s Catholic Church.